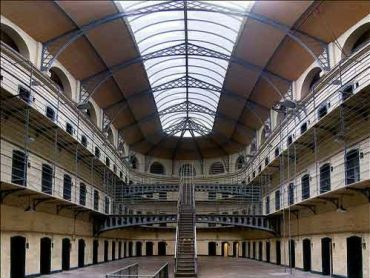 "ERRANT GIGANTES IN DIEBUS ILLIS"
Kilmainham Gaol has played an important part in Irish history over many centuries. 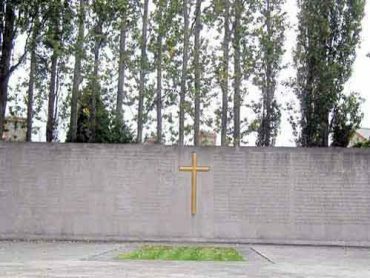 The military cemetery at Arbour Hill is the last resting place of 14 of the executed leaders of the insurrection of 1916. 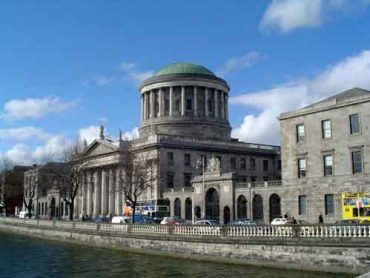 The Four Courts was reconstructed in 1932 according to Gandon’s original plans. The hall under the dome is open to the public. 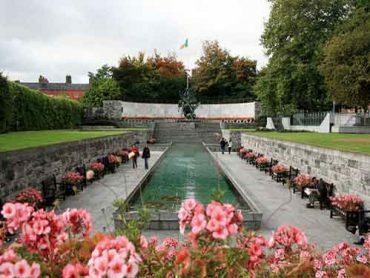 The Garden of Remembrance was designed by Daithi Hanly and opened during a week-long memorial celebration of the 50th anniversary of the Easter Rising. This photomechanical print, also known as a photocrom, is a reproduction of an actual photo. 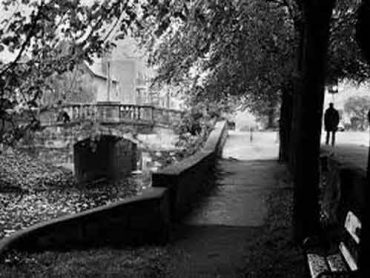 It was taken on the Southside of O’Connell Bridge sometime between 1890 and 1900. It was an Irish Argentinian who hoisted the Green Flag of the Republic over Dublin’s General Post Office during the 1916 Easter rising. The current Liberty Hall built in 1965 houses trade union offices and an events space. In 1916, a completely different structure stood here that was instrumental in the Easter Rising. 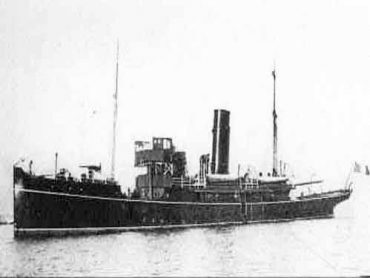 From Wednesday of Easter week, Liberty Hall, the GPO and other buildings in Sackville Street came under artillery and incendiary ﬁre, mostly from the gunboat Helga at anchor in the Liﬀey. 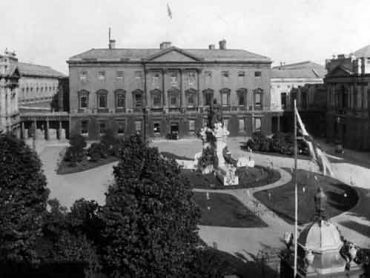 Leinster House is the home of the National Parliament of Ireland. 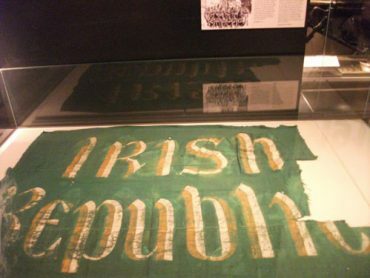 An original copy of the Proclamation of the Irish Republic hangs in the entrance hall. 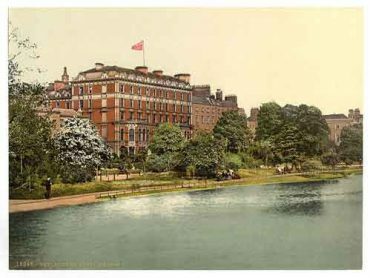 This photomechanical print was taken between 1890 and 1900 of St. Stephen’s Green most likely from an upper floor of the Shelbourne Hotel. 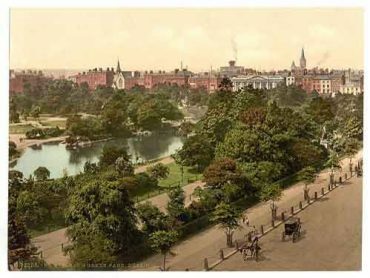 The view in this photomechanical print is taken between 1890 and 1900 and shows a young St. Stephen’s Green. Note the British flag flying atop the Shelbourne. At 11.00 a.m that morning Lieutenant Michael Malone led a small number of Volunteers from “C” company, 3rd battalion, towards Mount Street Bridge. 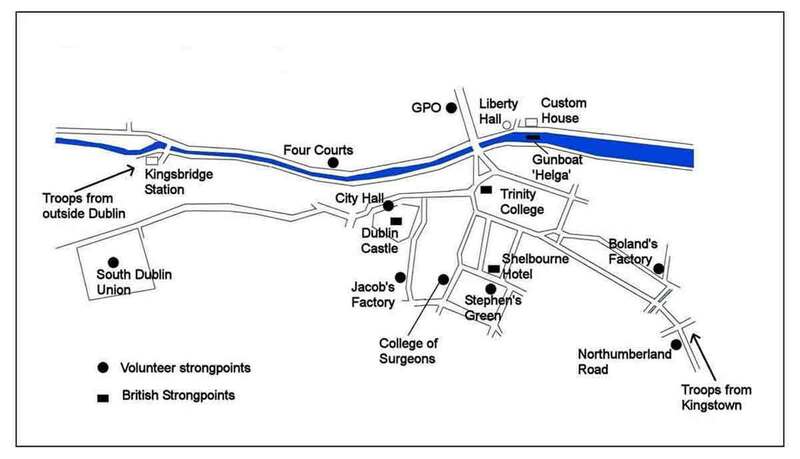 Their orders; to prevent British reinforcements from entering Dublin. The Activities of The 5th Battalion of National Volunteers in Ashbourne, Co. Meath, and the surrounding areas, between Monday 24th April and Sunday 30th April, 1916. County Wexford is famous in Irish nationalist folklore as the site of the 1798 rebellion. 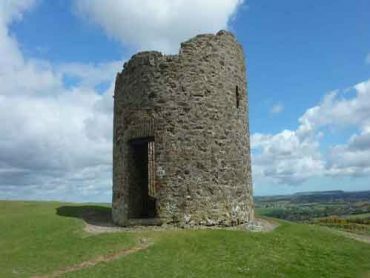 What is less well-known is the role of the county in the Easter Rising of 1916, when the town of Enniscorthy was taken over for a week by the local units of the Irish Volunteers. 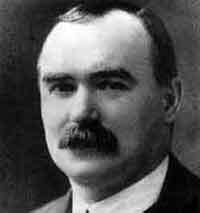 James Connolly: Born in Edinburgh in 1868, Connolly was first introduced to Ireland as a member of the British Army. 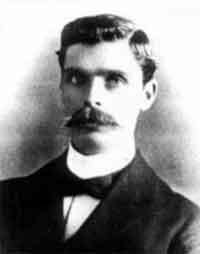 Despite returning to Scotland, the strong Irish presence in Edinburgh stimulated Connolly’s growing interest in Irish politics in the mid 1890s, leading to his emigration to Dublin in 1896 where he founded the Irish Socialist Republican Party. 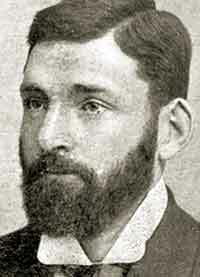 He spent much of the first decade of the twentieth century in America, he returned to Ireland to campaign for worker’s rights with James Larkin. 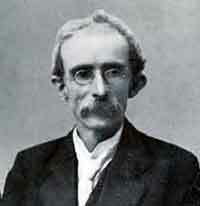 A firm believer in the perils of sectarian division, Connolly campaigned tirelessly against religious bigotry. 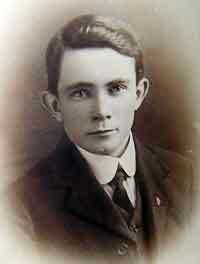 In 1913, Connolly was one of the founders of the Irish Citizen Army. 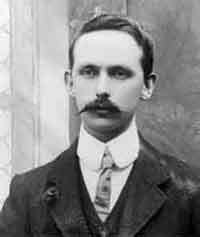 During the Easter Rising he was appointed Commandant-General of the Dublin forces, leading the group that occupied the General Post Office. 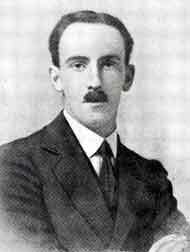 Unable to stand to during his execution due to wounds received during the Rising, Connolly was executed while sitting down on 12 May 1916. He was the last of the leaders to be executed. 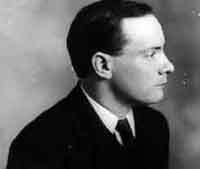 Patrick Pearse: Pearse was born in Dublin in 1879, becoming interested in Irish cultural matters in his teenage years. 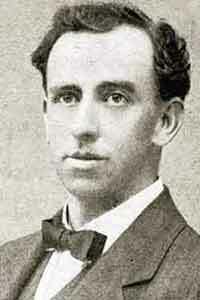 In 1898 Pearse became a member of the Executive Commmittee of the Gaelic League. 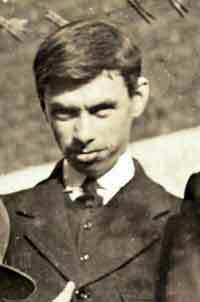 He graduated from the Royal University in 1901 with a degree in Arts and Law. 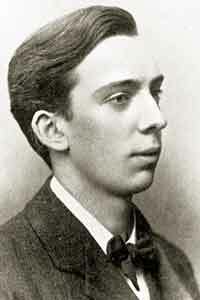 Pearse’s literary output was constant, and he published extensively in both Irish and English, becoming the editor of An Claidheamh Soluis, the newspaper of the Gaelic League. 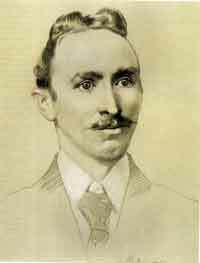 He was a keen believer in the value of education, and established two schools, Coláiste Éanna and Coláiste Íde, devoted to the education of Irish children through the Irish language. One of the founder members of the Irish Volunteers, and the author of the Proclamation of Independence, Pearse was present in the G. P. O. during the Rising, and was Commander in Chief of the Irish forces. 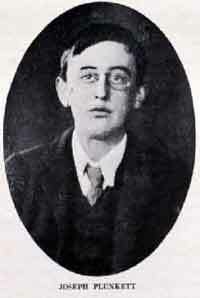 He was executed on 3 May 1916. 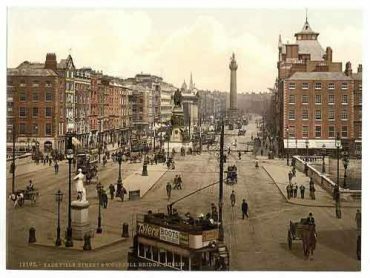 Visit the vibrant city of Dublin today and it is hard to see evidence of its turbulent history with the British government. 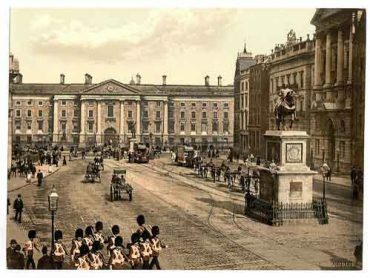 Dublin’s architecture and street layouts bear the positive influence of the British Empire, but Dublin would probably not be such a thriving capitol city if not for its pursuit of independence. Ireland has a long history of fighting to free itself from the grips of the British. It started all the way back in the 12th century with Henry II, King of England. 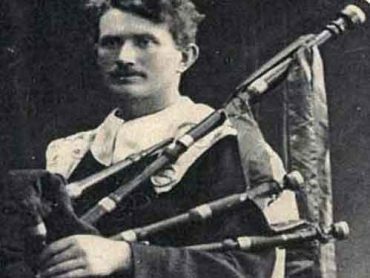 By the 14th century, the Gaelic culture was suppressed. The 15th and 16th centuries saw tremendous religious persecution and de-ownership of land by those who rebelled against the British. The Great Famine (1845 – 1849) however is often cited as what eventually provoked the Irish to take such a drastic stance against the British in 1916. For various reasons, Britain turned a blind eye to the famine, withholding food and assistance. It is estimated that one million people died of disease or starvation as a direct result of the famine. A further one million emigrated, many seeking refuge on American shores. With the loss of nearly 25% of Ireland’s population in less than a decade, the Irish language, culture and identity were threatened. 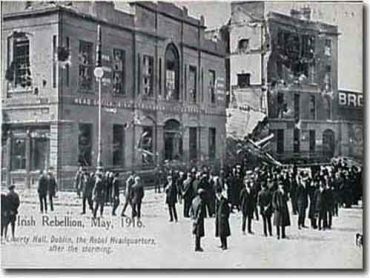 The 6-day battle which started on Easter Monday April 24, 1916 is often credited with being the turning point in the fight for Irish independence. While not a success story in the traditional sense, The Rising helped to ignite a passion for freedom amongst the masses. 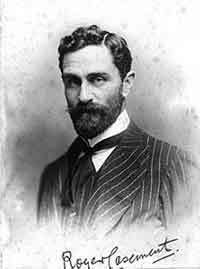 Public support grew during the War of Independence (1919 – 1921) and the Irish Civil War (1922–1923). This historic tour focuses on significant moments in Ireland’s political history, most notably landmarks and events relevant to the week of the Easter Rising, just one chapter in this long story.